For the 5th Day of Christmas, I bring you a race entry from Rock n Roll Marathon series! The winner of this giveaway will have their choice of a half marathon or full marathon in any of the races located in the Continental US!! 2015 will mark my 3rd year being part of the Rock n Roll Marathon blogging team and we will run at least three of their races. My husband and I absolutely love their events - tons of fun, great on-course and post entertainment and celebrating afterwards in a beer garden! The Rock ‘n’ Roll Marathon Series is the ‘World’s Largest Running Series’ with more than 500,000 people taking part in 26 North American cities each year. The Rock ‘n’ Roll Marathon Series features live bands along the course, cheer teams and entertaining water stations. Celebrate your finish at the outdoor finish line festival, featuring some of the best music acts around. Past performers include the Goo Goo Dolls, Macklemore, Counting Crows, Chris Isaak, Bret Michaels and Sugar Ray. 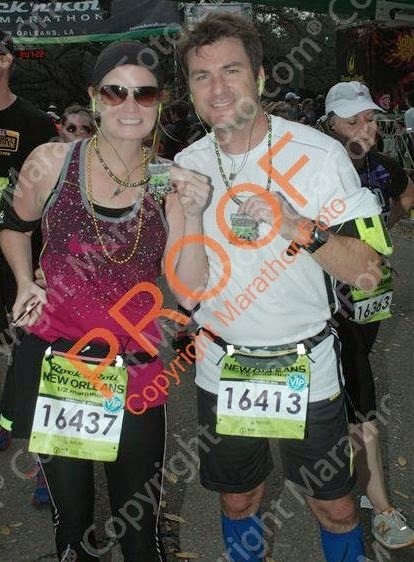 We are headed back to New Orleans in January to run the Rock n Roll NOLA Half Marathon. We ran this event in 2013 and it is a fun race in an amazing location. We will make a mini vacation out of this race, starting with eating our way through the city and finishing it by running 13.1 miles around through it. 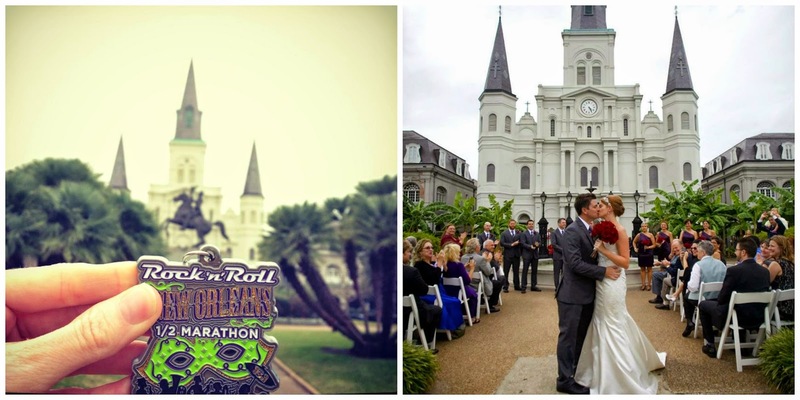 This year will be exciting as we get to run by Jackson Square, the location we got married at 2 months ago! You will find a ton of supportive runners at Rock n Roll marathon races. I have met a lot fellow runners online through chatting about their races. It is very easy to find groups doing tweet ups before the race - you can find race specific hashtags on Rock n Roll's social channels. My friend Brian of Pavement Runner has done a ton of Rock n Roll Marathon tweet ups and runs a lot of their races. Definitely check out his blog for race recaps if you're looking to do a Rock n Roll race. Below is the 2015 Rock n Roll Marathon Series lineup (US locations). Let me know in a comment below which of these you would choose and why! You should see a Rafflecopter Widget below this - after you comment, go through the widget to gain your first entry and unlock more chances to win. If it doesn't appear right away, please give it a few minutes and refresh. I'm trying to talk my wife into running Las Vegas next year and winning a free entry would seal the deal! Thanks for the opportunity! I'm going to run the country music marathon in Nashville! I would most likely select San Diego as it's my hometown option. However, my dad - a "50 state" goal marathon runner, just had to pull out of his February marathon due to injury. The last two years we have race-cationed together and since he has already run CA, I would not be opposed to letting him pick the location for another daddy-daughter run based on which states he still has to knock out. I think it ate my comment. I would like to run NO or DC. Savannah too, but I already plan on doing W&D and I can't be one of those crazy/amazing runners that does both. I would love to do Brooklyn or DC! I want to run in Nashville. It's one of my favorite cities and this race has been on my bucket list for a few years. Brooklyn! It'll be in my backyard this fall. Brooklyn because I'd love to go back an visit! I ran all the 10ks and would love to continue the streak. I would love to run through Savannah! Just love all those little plazas and the big ole live oaks. My sister is planning to move to Raleigh or Nashville in the next couple of months, so it would be great to go visit her and run a Rock n Roll race, too! I would love to do the Seattle one because it was such a fun and scenic one last year! I'm already signed up for the Portland one. San Jose or San Francisco!! Oh man, what a great giveaway!! I would run Nashville. I have wanted to run RnR Nashville the past 2 years, but have not had the chance to yet. I'd love to run in San Francisco, CA or Las Vegas :) Thanks for the giveaway. NOLA because it will be 3 days before my 30th birthday! !